Here it is!! The part 2! 🙂 Actually, I was going to do a pinafore but when I saw how well the apron turned out I decided to leave it. What do YOU think?? Should I leave it as is or go ahead and turn it into a pinafore?? Leave me a comment and let me know! When I take pictures for the tutorials I usually take 3 shots per step just in case. Well, in this case all 3 shots of the first few steps were blurry. GRRRR!! I think I must have had something on the lens. SIGH… So, I will be telling how but I won’t be able to SHOW you for the first couple of steps. But don’t worry! This is super easy!!! Step 1 – I cut my yard of Swiss dot stuff into 4 equal sections. Step 2 – Sew 3 of the pieces together with the lace part in the middle. 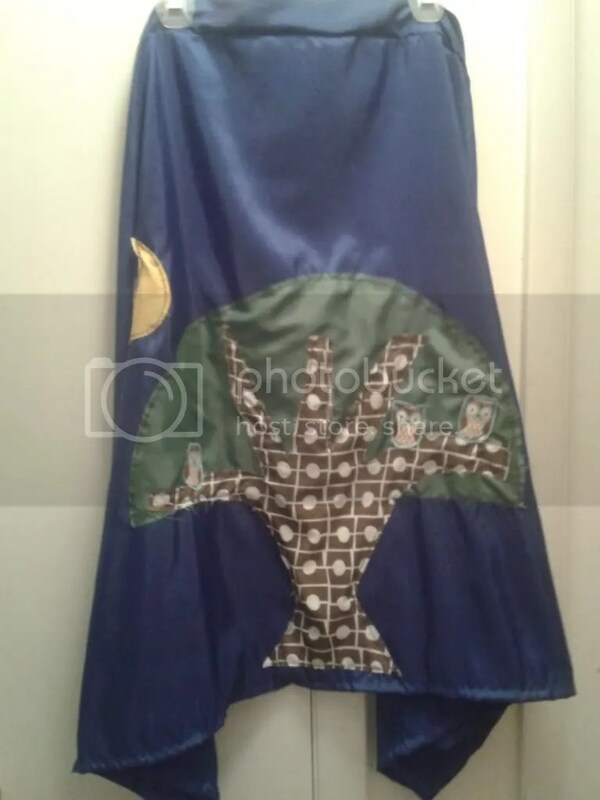 (You can look at the pic of the apron above to see what I mean). 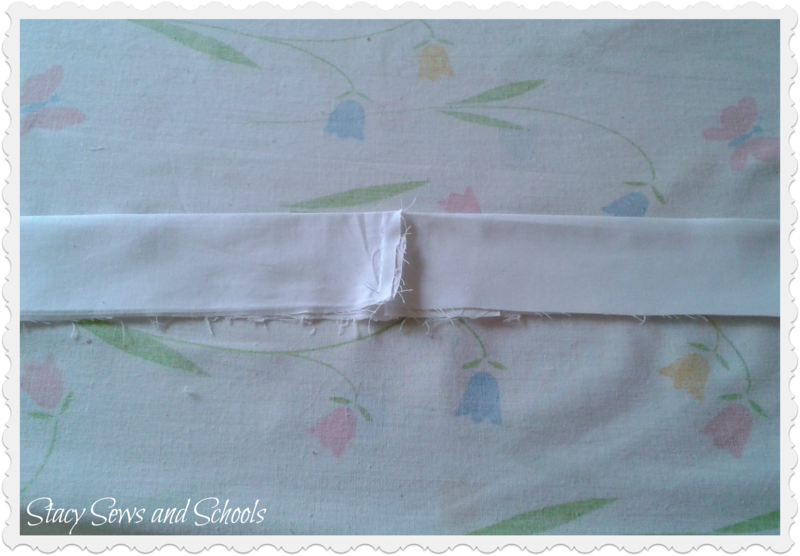 Step 4 – Sew a hem on the 2 sides. NOT the top and bottom. 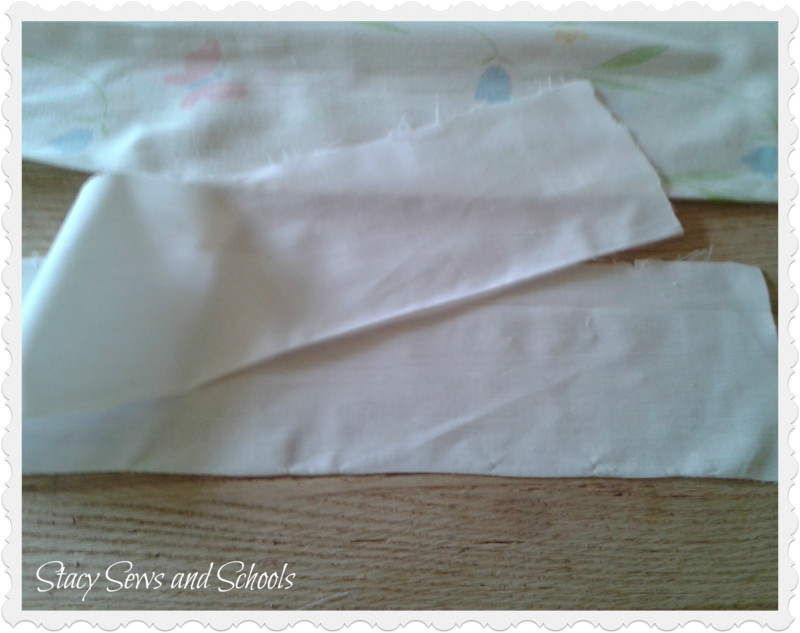 Step 5 – My 2 yards of leftover cotton sheet was in 2 pieces so I needed to sew those together. 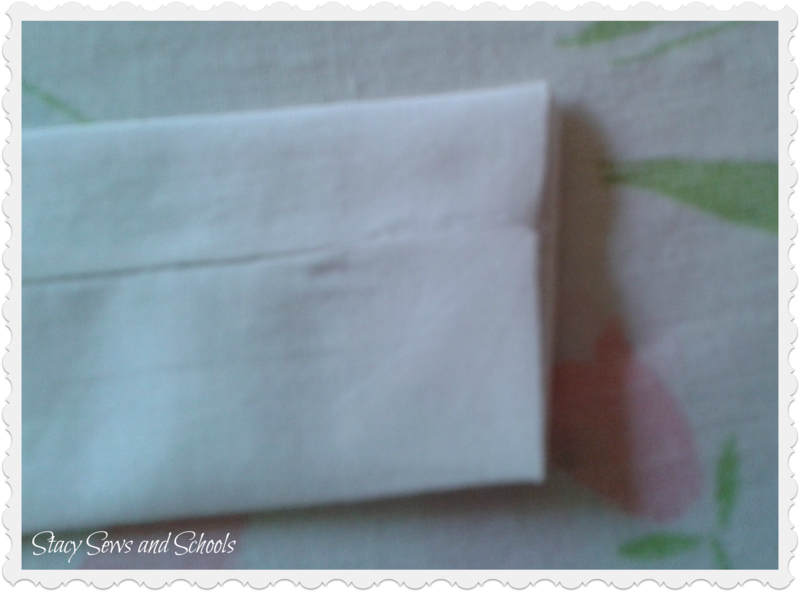 Step 6 – Then I folded it down the middle lengthwise and pressed. 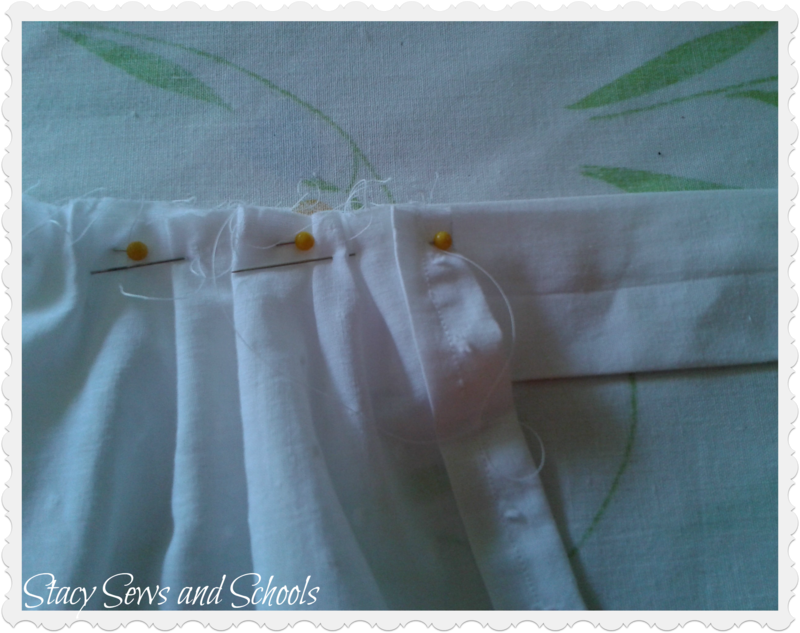 Pin and sew the sides together. 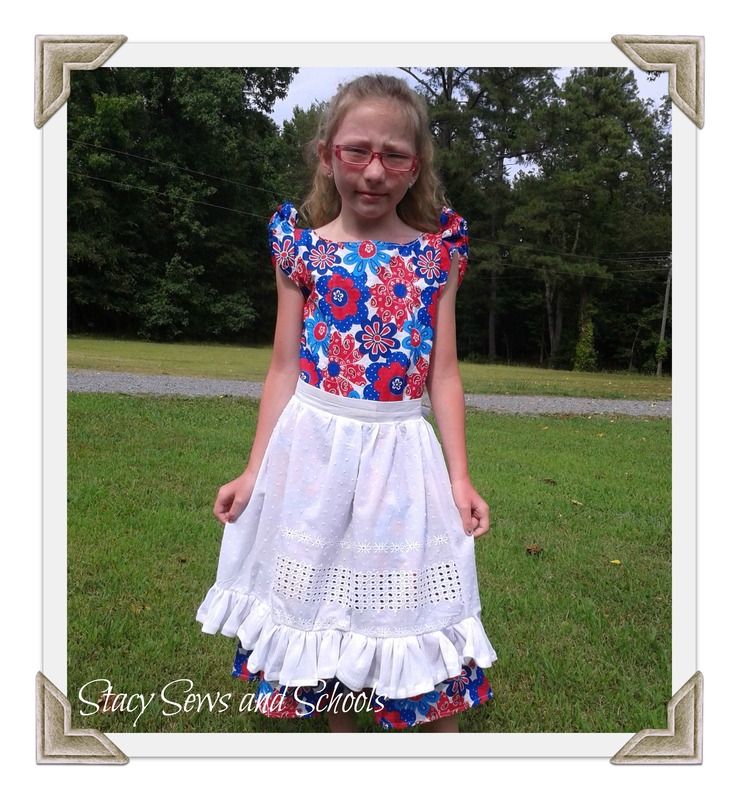 If you had to use more than one piece to get the 2 yards make sure your seam is on the outside when you sew the sides together. Step 7 – Turn fabric tube right side out (SORRY!! I hate that part, too!!) and press with the seam in the middle. 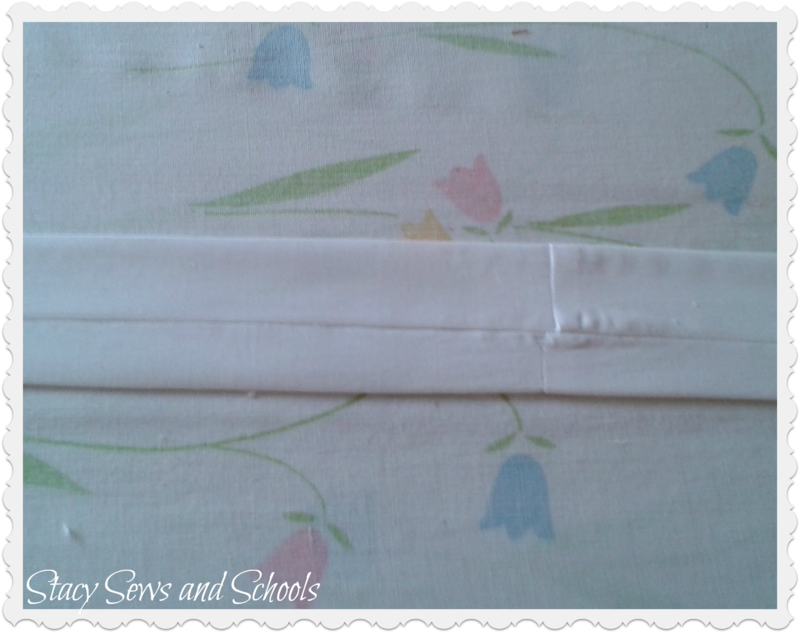 Step 8 – Tuck in the ends, press and sew closed. Sorry this one is blurry. 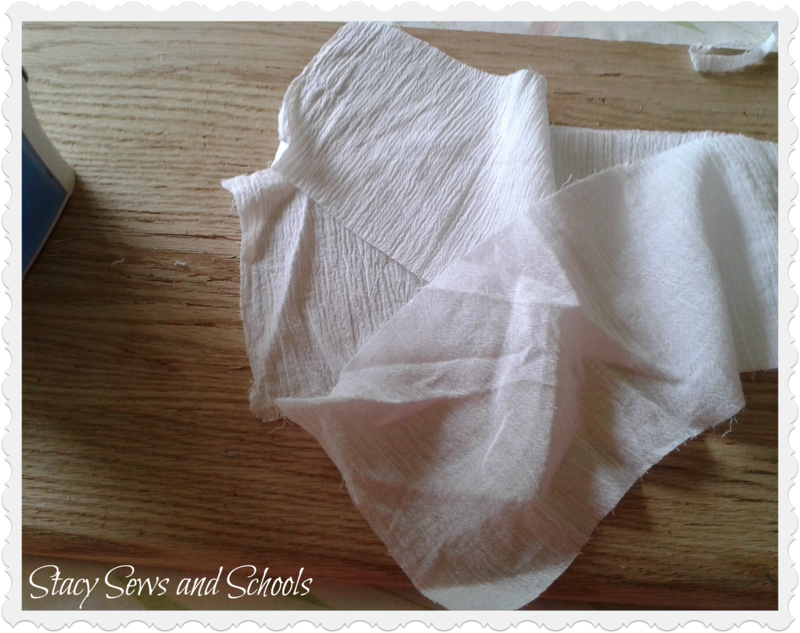 Step 9 – My 3 yards of cotton gauze was in 3 pieces so I had to sew the ends together. 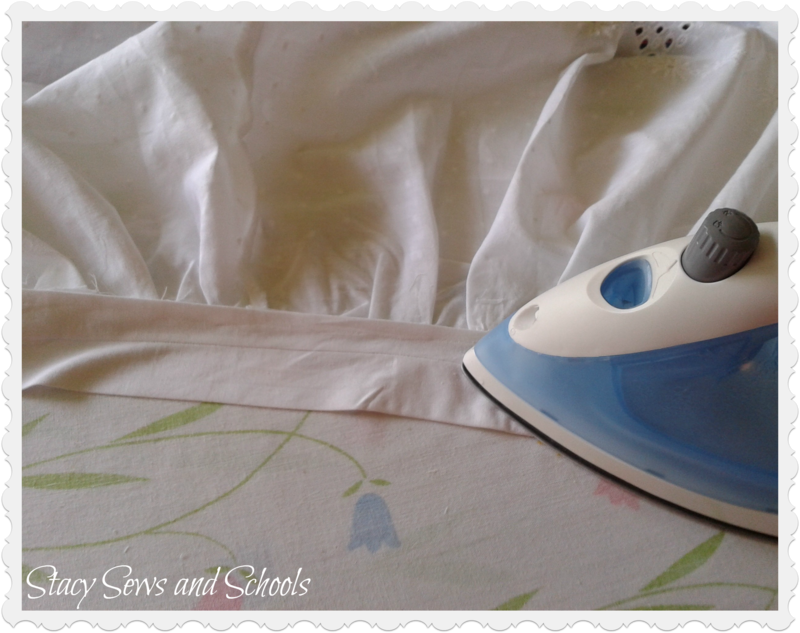 Step 10 – Fold up 1/2″, press, fold up another 1/2″ press, pin and sew hem. Do the same to the 2 sides. 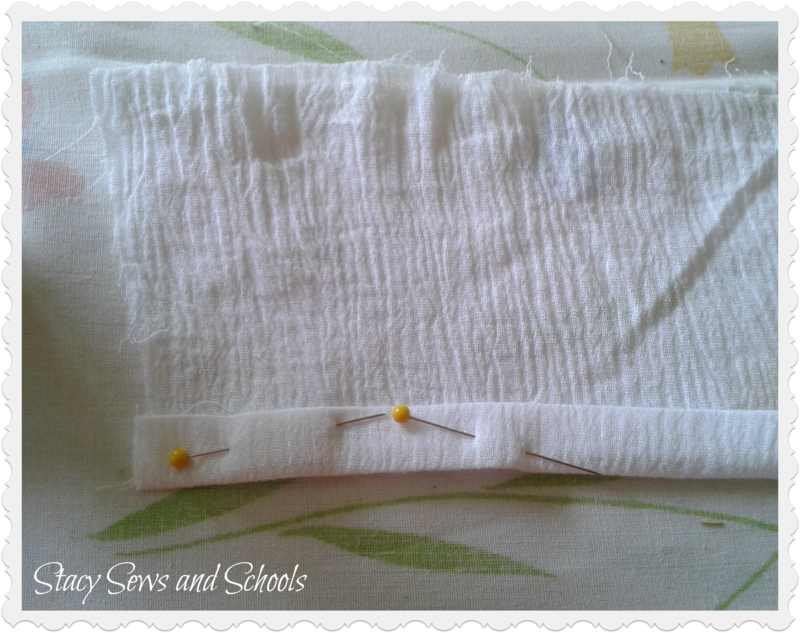 Step 11 – Sew a gathering stitch across the top of the gauze strip. 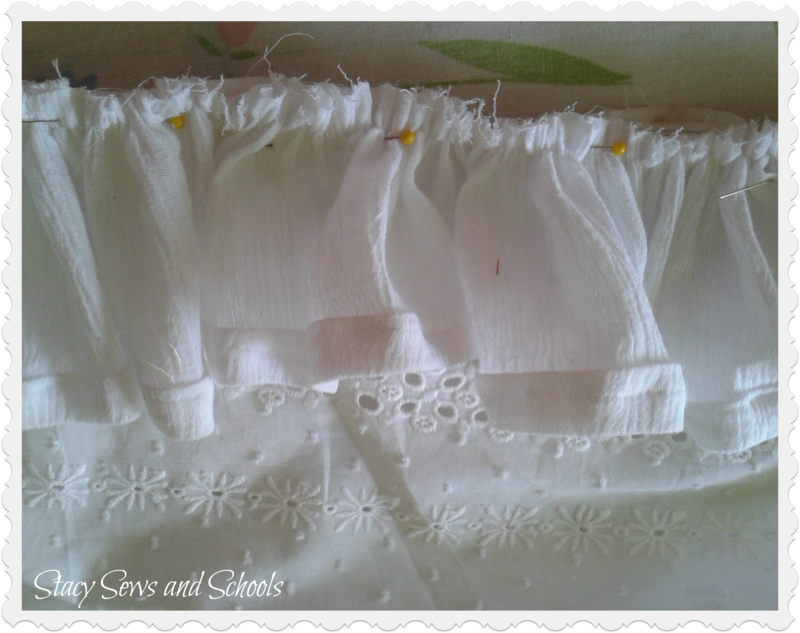 To sew a gathering stitch on my machine I set both stitch dials to the highest setting. 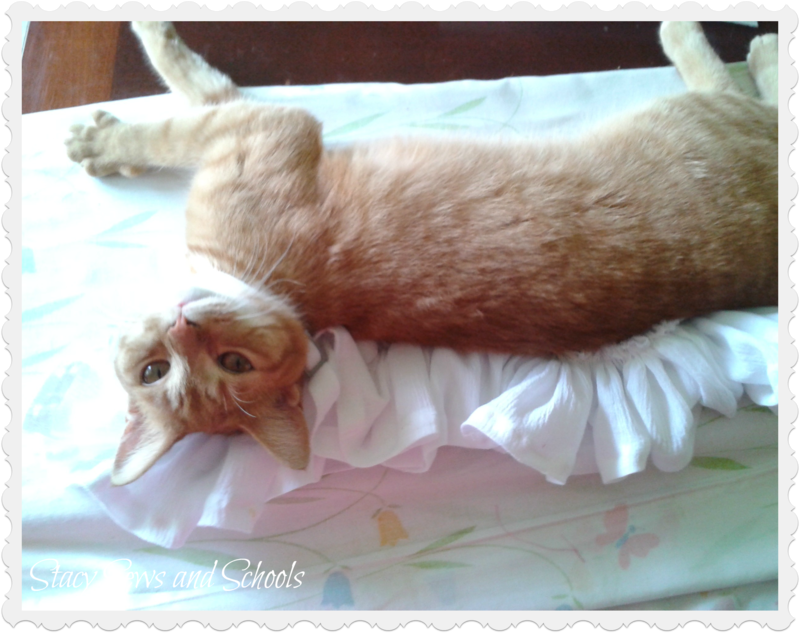 Step 12 – Remove the DARN CAT!! 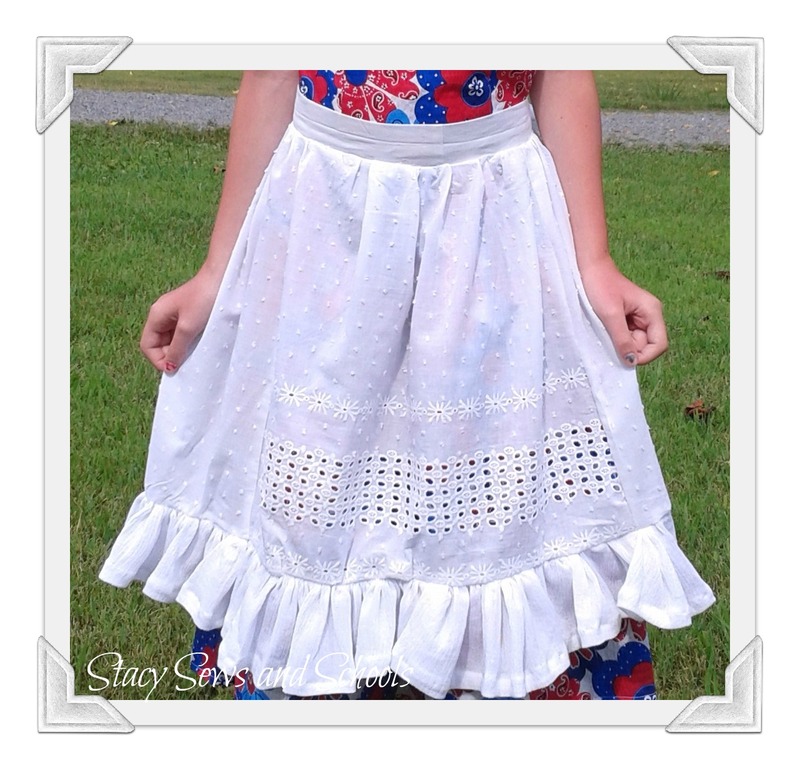 Step 13 – Pin the top of the ruffle to the bottom of the apron with right sides together, adjusting gathers as needed. Sew. 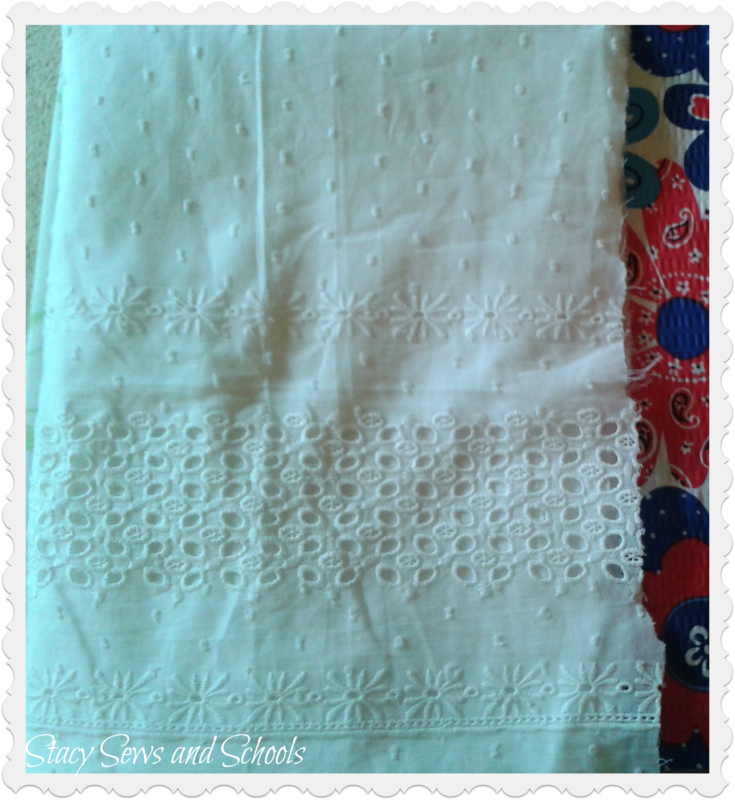 Step 14 – Run a gathering stitch across the top of the apron. 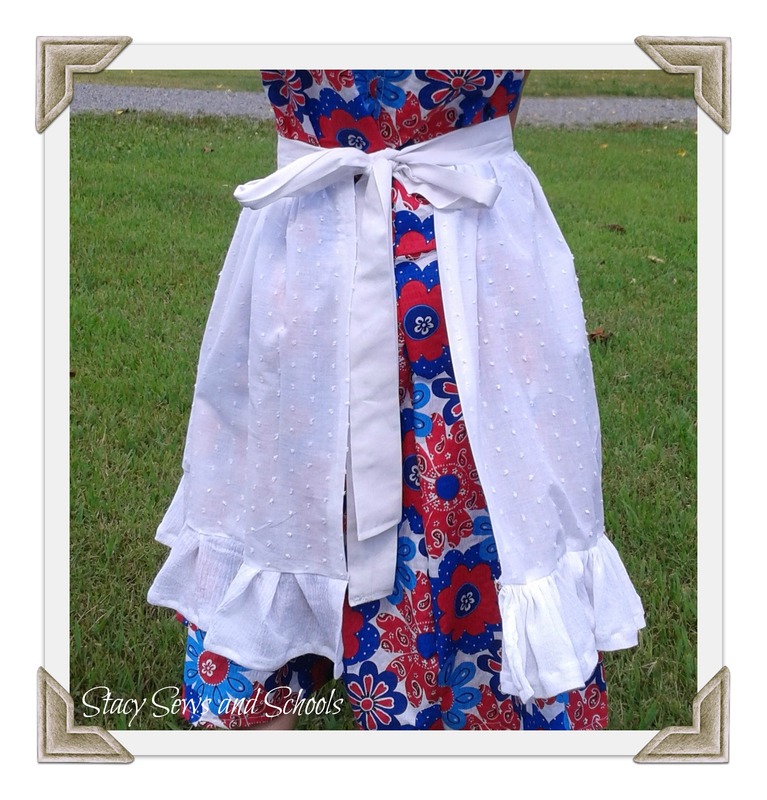 Pin top of apron to the bottom of the ties, right sides together, adjusting gathers as you go. Step 15 – Flip over and press the back side. 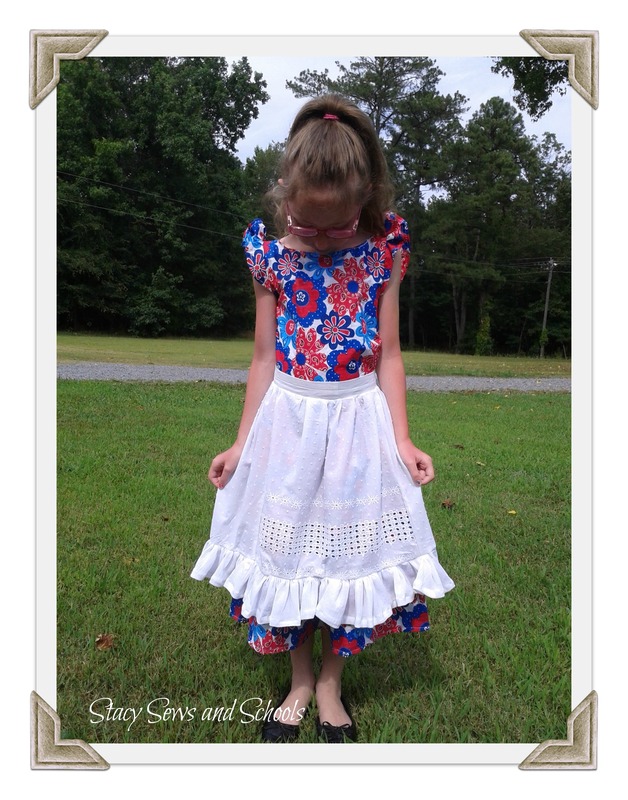 I think the apron gives the dress a vintage/retro/old-fashioned look. What do you think?? As always, let me know what you think. Was this easy to follow? If you have ANY questions, just ask! I would be more than happy to answer them. Let me know if you make this!! I would love to see it! !